I have a brand new Circuit Sword I just built and I am unable to get wifi to work. I am also unable to use the mode button for alternate functions. I have checked all of my wiring. Everything else is fine. I have 2 layers of kapton tape over the mode switch pins and another layer on the USB-C jack itself (wrapped around it's exterior). I did a continuity test on the power cable connector for the mode button to ensure I soldered it in correctly and that the tact switch itself was functional. I did eventually lockup the Pi and was able to flip the power off (it didn't gracefully shutdown since it locked up) and use the mode button to insta-kill power. So I know the button is functional. I have also tried using the mode functions with the two halves split to no avail. I also ran the update.sh and the cs-tester from the Circuit Sword directory and they did not help either. Any ideas on what could cause my 2 issues (wifi & mode functions)? P.S. I did perform the electronics sanity check before my build and with the shell open after my build. All mainboard LEDs operate as expected. OK so I commented out normal and uncommented tester. system still booted in to ES and ran normally as if not in test mode. Power switch safe shutdown the system. Put SD card in PC again and opened config-cs.txt with notepad++ again and verified only tester was uncommented. 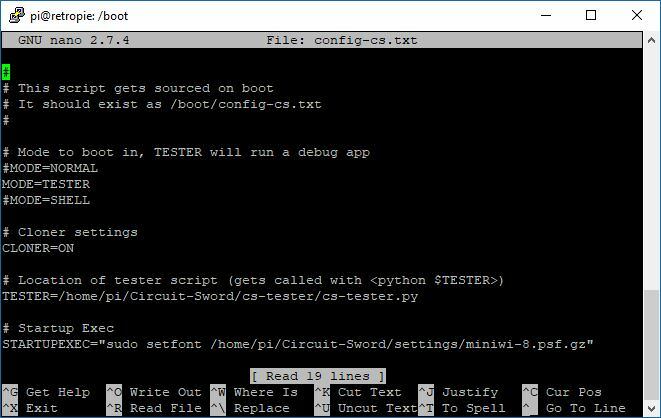 EDIT: wiped out the config-cs.txt file completely and created a new one in nano thru putty. now it's in test mode finally! I get the color pattern then the terminal info. All 5 status items are green. The first 4 say 'OK' and the 5th says 'ON'. Flipping off the power switch still does a graceful shutdown instead of showing requested power state on screen. Ok, on the main PCB board, in between the CM3 slot and the speaker connector, should be a small yellow LED .. could you please describe the behaviour of this LED? Could you also hold the mode button (the one on the PCB) and see if this LED changes behaviour?